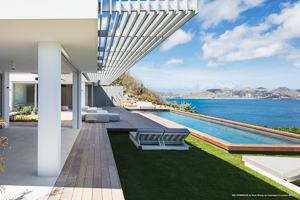 Villa UJV 215, also referred to as Villa Domingue, is a lovely four bedroom, four bath villa, in Pointe Milou, St Barts, with a Mediterranean feel. Recently updated in 2012, the living room comfortably seats 8 to 10 people on a plush sofa covered with soft linen. It's a modern style that flows perfectly with the nearby kitchen and dining corner. The Bose sound system in the living room as well as outside on the upper and lower decks allows for separate musical programs to play inside and outside. The walls are white with lots of angles and terracotta tiles throughout the villa give it a very cool feeling, . The new bathrooms downstairs are Mediterranean inspired with white tiles on the walls and floors with touches of blue and green. Multi-level wooden decks surround the pool and afford spectacular ocean views. The villa is extremely comfortable and wonderful for a group of friends or an adult family. PLEASE NOTE: there are no breakdown rates offered for bookings over Thanksgiving. There is an age limit on children due to safety reasons.